Hibiscus acetosella, the cranberry hibiscus, is a somewhat upright, shrubby plant that is grown mainly for its flashy foliage, which can come in stunning shades of copper and burgundy that rival red maples. Hibiscus is a large genus of over 200 shrubs, trees, annuals, and perennials. Many can appear tropical and exotic with colorful, sometimes plate-sized flowers, however, Hibiscus acetosella is grown for its colorful, ornamental leaves. Because Hibiscus acetosella has recently become popular with plant breeders, there are several excellent varieties from which to choose. Cranberry hibiscus plants are short-lived sub-shrub or woody perennials, that may only survive for a handful of years, but since they grow so rapidly, they are still a good value for the garden. Besides their beauty, they have edible flowers and leaves that have a pleasant tart taste. 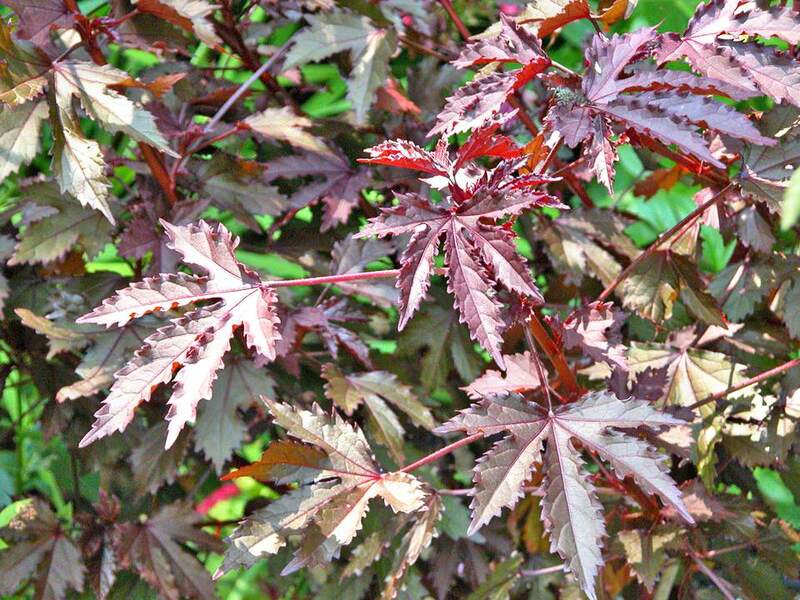 Foliage: The leaves can be ovate or lobed, but the newer varieties have been bred to have deeply lobed, finely cut leaves like Japanese maples. You’ll find them in shades of green with red veining right through to a full deep burgundy leaf. Flowers: The cranberry hibiscus has typical Hibiscus funnel-shaped flowers in yellow and red. Unlike most other hibiscus plants, the flowers are incidental on Hibiscus acetosella and some of the newer cultivars don’t flower at all. Form: Although Hibiscus acetosella is an upright grower, mature plants can split and flop. The hardiness rating of Hibiscus acetosella depends on the variety you are growing. Most are only hardy in USDA Zones: 7 - 11, however, they can be over-wintered in containers, indoors. If you do not have sufficient light to keep Hibiscus acetosella growing indoors, it will go dormant and can be tucked somewhere cool, dark, and out of the way. Water the soil when it feels dry and move it into the sun in early spring. Be patient, it may not start sending out new growth until late spring. Hibiscus acetosella grows best in full sun to partial shade. You will get the best color in full sun, but the plants may need partial shade in extremely hot, dry conditions. There are sporadic blooms throughout summer, but the flowers are not very showy. The newer cultivars, which are bred for their foliage, tend to bloom less frequently than the species, if at all. Hibiscus acetosella makes a nice focal point, where a Japanese maple might be too large. They combine strikingly with chartreuse plants as well as with softer shades of pink and white. Some of the smaller cultivars make excellent potted plants and can be overwintered in a greenhouse. Cranberry hibiscus plants are fairly low maintenance. Their biggest need is water. Keep the plants moist, but don’t allow them to sit in wet soil. Container plants may need daily watering, so position them near the hose. If allowed to dry out for long periods, Hibiscus acetosella will drop its beautiful leaves. Fertilize monthly to bi-monthly during the summer, with any balanced fertilizer. Don’t over-feed container plants, unless you have a larger container to move them to. They grow quickly. Pruning is not required but can be done to shape or control the size of your plant. Branches that grow fast and long will tend to arch and open the center of the plant. Some pruning helps this Hibiscus to maintain a bushy shape. Wind can also take its toll on long branches and tatter the leaves. Overwinter indoors, where Hibiscus acetosella is not hardy. You can also take small cuttings in the fall, to overwinter for next spring. Hibiscus acetosella is fairly problem free, although Japanese Beetles will skeletonize the leaves. How Deep Should You Plant Your Spring-Flowering Bulbs?